Survey findings show that Amazon and Barnes & Noble will face strong preference for Apple’s iPad among college students over their just-released tablet models. 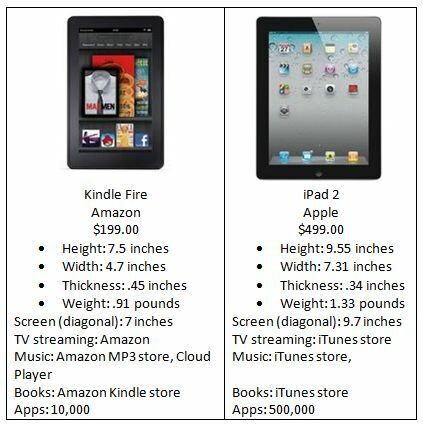 In the same week that Amazon launched their Kindle Fire and Barnes & Noble launched their Nook Tablet, marketing research students at Roger Williams University surveyed college students across the nation for their reactions to the new products. The survey indicated that undergraduates would prefer to receive the Apple products over their competitors by a statistically significant margin, while they appeared indifferent between the Kindle and Nook offerings. The study demonstrates the strength of undergraduates’ affinity for Apple products. That preference is shared across gender, income levels, and college class, indicating that the feeling is pervasive in the undergraduate culture. From the giver’s perspective, however, most students would be at least moderately pleased to receive the Amazon or the Barnes and Noble tablets and the price tag is half or less than the cheapest iPad device. With these two devices just launched on the marketplace, a prospective giver must judge whether the user experience afforded by these tablets will measure up to the iPad at least in proportion to the price. Conducted during the week of November 14th, the Roger Williams survey was conducted online with a sample of over 150 students drawn from SurveyMonkey’s Audience panel of respondents. According to Professor Edward Strong of the Mario J. Gabelli School of Business, the class began by studying the adoption of eReaders among college undergraduates. What they found was that Nielsen Research reported that college students were actually declining as a percentage of users of tablet computers and eReaders. Textbooks play a huge role in students’ lives, and at the beginning of the current eBook “boom” the idea of reducing the weight of textbooks by switching to the electronic format was thought to be compelling. Experience indicates, however, that eReaders do not fit the needs of frequent consultation, marginal note-taking and random access that typify student use. As recent surveys and books have indicated, undergraduate reading has decreased in recent years, so in addition to the difficulty of using eReaders for textbooks, students spend little time in reading for leisure. The typical respondent to the Roger Williams survey reported spending between four and six hours per week in reading, and less than ten percent of that time was spent in reading for pleasure. The Roger Williams study indicates that college undergraduates see tablet computers as an also-ran in desirability while their preferences with respect to brand are clear. The study indicated that only 11 percent of undergraduates had tablets and 12 percent had eReaders. At the same time, 96 percent had laptops and 50 percent had smartphones. Almost 40 percent of the laptops and 45 percent of the smartphones were Apple products. This broad ownership of devices with screen sizes just on either side of tablet computers makes tablets seem less desirable to undergraduates. As the focus of the study shifted to tablet computers, it was apparent that the higher perceived initial cost of a tablet computer (as compared with a smartphone) meant that few students felt compelled to buy a tablet.